In 2004, Trevor Horn celebrated 25 years as one of the world's most successful pop music producers. 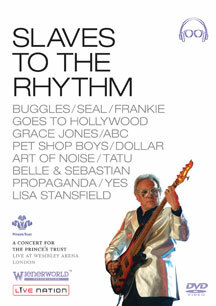 In Slaves to the Rhythm, a unique Wembley concert in aid of the Princes Trust in 2004, 13 of Trevor Horn's best selling acts, guest musicians and a full backing orchestra, came together to help celebrate - over two hours of electrifying music, in one place, at one time, for one man. Artists performing in this very special DVD include Yes, Seal, Pet Shop Boys, Frankie Goes to Hollywood, Grace Jones, Lisa Stansfield, ABC, Art of Noise, Dollar, Propaganda, Belle & Sebastian, Tatu and of course The Buggles. With the full concert, documentary and jukebox facility, all the energy and excitement of Slaves to the Rhythm are captured on this perfectly mixed DVD. Trevor Horn's groundbreaking musical career reads like a 'who's who' of popular music. Starting with his own band, The Buggles and the legendary global hit, 'Video Killed The Radio Star', he then joined YES, first as band member, then Producer. His production career continued with artists such as Frankie Goes to Hollywood, ABC, Godley & Creme, Paul McCartney, Seal, Simple Minds, Lisa Stansfield, Rod Stewart, Tatu and the list goes on and on. Uniquely, in the history of music, "Owner of a Lonely Heart" with YES and "Relax" with Frankie Goes To Hollywood resulted in Trevor being the only Producer to have simultaneous number one records in both the UK and the USA. His musical genius has created boundless worldwide hits and in the process, played a hugely influential role in shaping many artists careers as well as popular music culture.